Municipal offices are located at 100 East High Street, Pottstown PA 19464; phone: 610-970-6510. Pottstown Borough was incorporated in 1815. Pottstown Borough is served by its own, independent Public School District. Pottstown has a large inventory of 19th century residences found especially along Beech Street, Charlotte Street, Chestnut Street, Evans Street, Kings Street, Spruce Street, Walnut Street, and York Street. The convergence of the Manatawny Creek and Schuylkill River was an attractive location for members of the Delaware Indian tribe and foreign explorers. Settlements were formed in the area of Pottstown, but the current location of was not created until 1717 when the area around the Manatawny was bought and used for iron production. By the mid 1700's, Thomas Potts, who was an ironmaster, had multiple iron interests in the Pottstown area. John Potts bought the area that would become Pottstown and eventually, the name Pottstown was created from people referring to it as Pott's Town. Pottstown was incorporated as a Borough in 1815. Pottstown was a metal manufacturing town, first as an iron producer and later as a steel producer. This industry was prevalent in Pottstown until the early 1900's, picked up during both World Wars, and all but ended after WWII when increased competition started to slow production demand. The Schuylkill River played a significant role in the development of Pottstown. The Schuylkill Canal opened in 1824 and provided the first mode of transportation besides horse, bike or walking. Bicycling was a very popular means of transportation in and around Pottstown. By 1839, steam locomotives were running between Reading and Philadelphia, with a stop in Pottstown. Citizens who opted for motorized transit also had two trolley lines running from Sanatoga to Stowe and High Street to Ringing Rocks Park. Pottstown was the traditional hub of activity. The Borough was a large employment center and had many cultural activities, shops and banks that lined the streets. The school system dates back to before 1800 when two log cabin school houses existed. In 1838, Pottstown established a public school system. Multiple school buildings were built around this time and in 1890, a large school building with multiple rooms was constructed. Private schools were always a prominent part of the history of Pottstown. The Hill School was opened in 1851 and run as a family operated school until 1920 when it became a not-for profit operation. In the 1860's, a water company was formed and water was pumped to a reservoir on Washington Hill. A municipal sewer system was not installed in the current day Borough until development pressures in 1915 brought about a need for it. Today, there is public water and sewer and an adequate road network throughout the Borough that is an asset to future redevelopment of the area. Today the Borough has been hit by the dwindling presence of the steel industry and by the closing of other major employers within the Borough. Positive steps to turn the tide have been made and more work is being done to revitalize the Borough. Old Pottstown – This National Historic District includes the downtown of Pottstown Borough. It contains small and large commercial buildings; the early churches of Pottstown; the houses of Pottstown's early wealthy citizens and community leaders; the homes of ordinary persons; buildings of fraternal organizations, some industrial and warehouse structures; and government buildings. The environment is an expression of the days of great expansion and prosperity in Pottstown and western Montgomery County. The District's wide variety of architecture spans an era from 1850 to 1930 and includes late Federal, Victorian, Gothic Revival, Italianate, Richardsonian, and late Victorian. High Street – Pottstown's first suburban neighborhood is represented by this Registered National Historic District following High Street in Pottstown Borough. The establishment of a trolley line eastward along High Street allowed growth to spill beyond the borders of the Borough's original boundaries. The large houses of industrialists, business owners and managers, professionals, and civic leaders are found along the wide, tree-lined street. There are many 2 1/2 story single homes interspersed with large, semi-detached houses and a few smaller single homes. The landmark Grubb Mansion anchors the east end of the District. The architecture generally spans from 1875 to 1935 and includes Victorian, Late Victorian, Gothic Revival, Four-Square, and Classic Revival styles. Glasgow Village – located on the edge of Pottstown Borough near West Pottsgrove is eligible but is not designated as a National Historic District. The area represents a mid-19th century working community centered on the former Glasgow Iron Works. Still to be seen are the homes of the iron-master, workers, and managers. A stone water tower also remains. A number of the individual buildings would also quality as architectural landmarks. The architecture generally spans from 1830 to 1870 and includes Federal, Queen Anne and Victorian Period styles. Fourth Street – This area in Pottstown Borough is eligible but is not designated as a National Historic District. It represents one of the earliest expansions of the urban core beyond the original boundaries of the Borough. This pleasant residential area features two-story, modest-sized, semi-detached brick homes. The grid street pattern reinforces the regularity and consistent quality of its structures. The architecture generally spans from 1865 to 1910 and includes Federal, Late Federal, Gothic Revival and Four Square styles. Charlotte Street – Pottstown's second suburban area is represented by this District, which is eligible but is not listed as a National Historic District. It is primarily a residential area. The establishment of a trolley line allowed for the development of a number of fine country homes and the Pottstown Hospital, north of the original Borough. Development was in the form of 2-1/2-story and 2-story semi-detached and single homes. A scattering of corner stores and the Jefferson Hotel were also developed. There are several large homes of landmark quality located along Charlotte Street, and the former four-story factory of the Merkle Light Motorcycle Company is located on Hanover Street. The architecture generally spans from 1865 to 1925 and includes Late Federal, Late Queen Anne, Mansard, Gothic Revival, Italianate, Four-Square, Victorian Period, and Commercial styles. 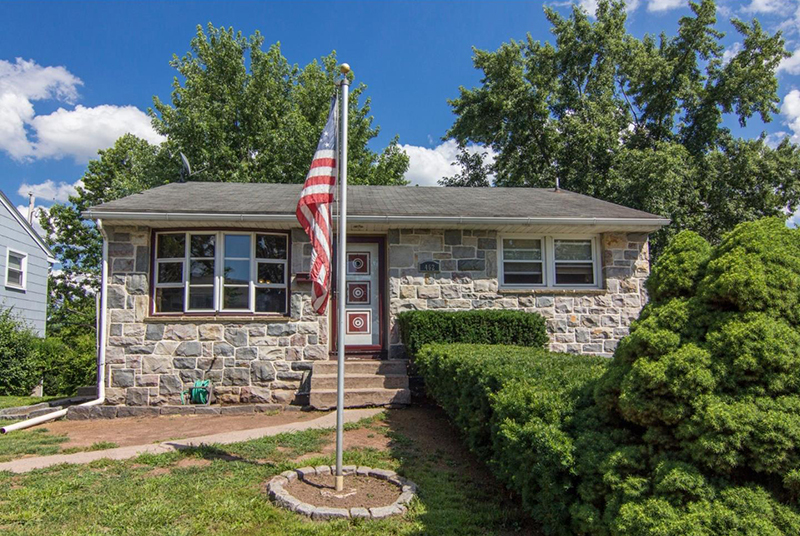 Lincoln Avenue – This historic district is a hillside community with a mix of 2 and 2-1/2-story, semi-detached, attached, and detached homes nestled around the Jefferson Elementary School and several churches in Pottstown Borough. It is eligible, but is not designated as a National Historic District. Both frame and brick masonry structures are found here. There are no landmark structures, but the overall level of architectural integrity is good. The architecture generally spans from 1870 to 1910, and styles include Late Federal and Late Queen Anne. The Hill School – The campus of the Hill School in Pottstown Borough has a number of outstanding edifices that represent the development of this private educational institution. Buildings range from one-story cottages to four-story dormitories. Buildings are of brick, stone, and stucco. The majority of buildings would be eligible for landmark status. The architecture generally ranges from 1850 to 1940, and styles include Gothic Revival, Queen Anne, Collegiate Gothic, and Medieval Revival. There are also several modern-style structures of note. This district is eligible but is not designated as a National Historic District. East End – This area of Pottstown Borough is primarily residential and represents a suburb of the 1920's. It is eligible but not designated as a National Historic District. Nearly all the houses are semi-detached, uniform in style, size, and color, and laid out in a regular pattern. The regularity of the architecture is reinforced by the rhythmic spacing of street trees. The uniformity of the environment makes it sensitive to even the slightest of irregularities. The architecture generally spans from 1910 to the late 1920's and its styles include Bungaloid and Four Square. Iron Works – This district in Pottstown Borough is eligible but is not designated as a National Historic District. It is primarily a residential area, this area also contains a foundry and several small industries. The neighborhood developed along with the foundry and the nearby iron works. The semi-detached houses and row homes provided shelter for those who worked at the steel mill on the other side of the tracks or at the foundry. The foundry complex provides an interesting architectural focus for the area. The architecture generally spans from 1875 to 1920 and includes Victorian and Late Victorian styles. South Side – This location with an interesting mix of architecture embodies much of the industrial history of Pottstown. Early industry along the river and later industrial development along the railroad provide the basis for this residential area. The semi-detached houses and row homes provided shelter for the mill and railroad workers. As an early ethnic neighborhood of German craftsmen, the area later evolved into homes for Eastern Europeans. A variety of industrial buildings, churches, and modest homes provide interest. Company-owned housing can still be seen. Landmarks include churches and mill buildings. The architecture generally spans a period from 1870 to 1900 and styles includes Late Federal, Victorian, and an Eastern European church. This area is eligible but not designated as a National Historic District.